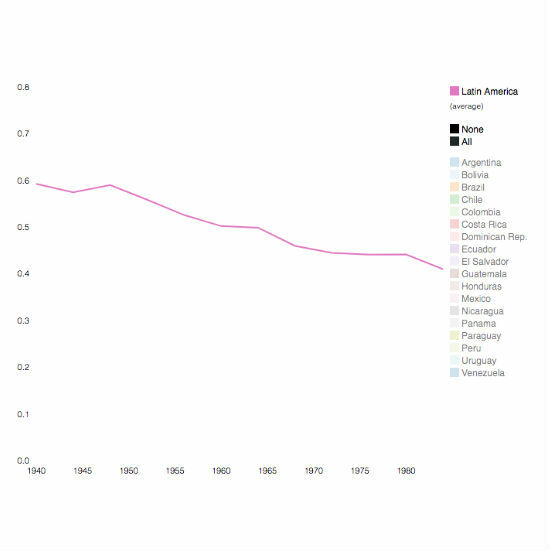 This site shows the evolution of educational inequality and social intergenerational mobility in Latin America for people born between 1940 and 1987. Various indexes for these measures (displayed in the left panel) can be visualized in an interactive map or in interactive trend charts. Furthermore, the data can be downloaded to be used for your own analyses. The Educational Persistence is the most widely used mobility index in the intergenerational mobility literature in economics. It is the slope coefficient from a linear regression of children's years of education on the years of education of their parent with the highest degree. This index captures absolute changes - e.g. because of educational expansions - as well as relative movements of families within the distribution. The higher the index the lower is social intergenerational mobility. The Educational Correlation or Standardized Persistence is the corellation between parents' and children's years of schooling. This index is neutral to educational expansions and measures just relative changes; i.e. if families change their position in the educational distribution from one generation to the next. The higher the index the lower is social intergenerational mobility. The Bottom Upward Mobility measures the probability of individuals with low educated parents (less than a secondary degree) to attain a secondary school degree. The Upper Class Persistence measures the probability of individuals with high educated parents (at least a secondary degree) to attain a secondary school degree. Click on a country to add/subtract it from the line chart. Click Date of Birth years to see results on the map. Economic and social inequality is one of the main problems that Latin America has historically faced. Both its evolution and its causes and consequences have been widely documented. However, we know much less about the degree of transmission of this inequality across different generations. Until now, issues of data availability have restricted a broader and cross-national perspective on the topic. Based on rich sets of harmonized household survey data, we contribute to filling this gap by computing time series for several indexes of relative and absolute intergenerational education mobility for 18 Latin American countries over 50 years and making them publicly available. 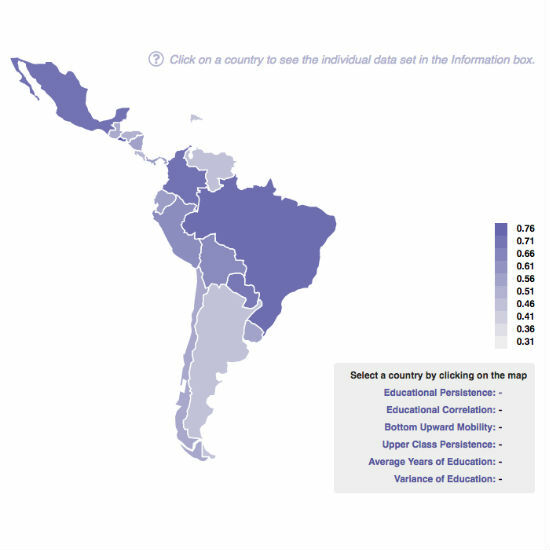 This site visualizes part of the indexes of intergenerational mobility that we estimate in our research project: "Educational inequality and intergenerational mobility in Latin America: A new database" forthcoming in the Journal of Development Economics. The data source we used to estimate the indexes shown on this website is the Latinobarometro survey. 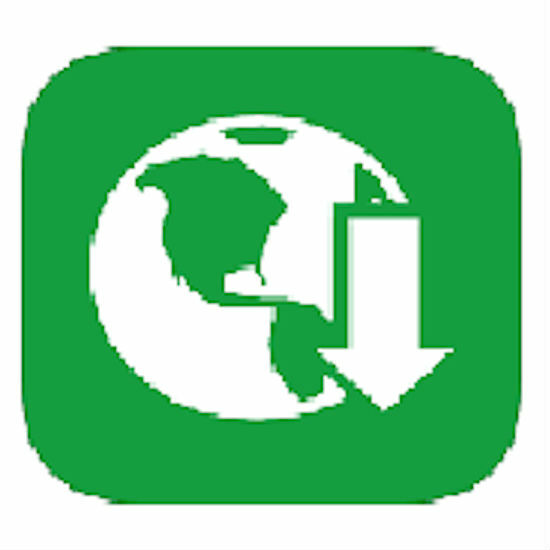 In the download section, all our generated indexes can be downloaded. These are estimated using Latinobarometro as well as other national household surveys of the single countries. For more information on our data sources and the indexes, please see our research paper. 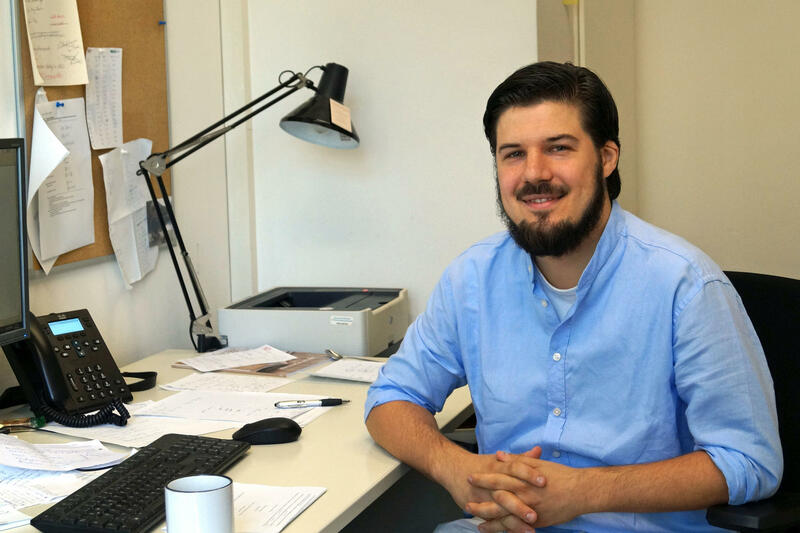 Guido Neidhöfer is Researcher at ZEW Centre for European Economic Research in Mannheim, fellow of the College for Interdisciplinary Educational Research (CIDER) and visiting researcher at the Center for Distributive, Labor and Social Studies (CEDLAS). He holds a PhD from Freie Universität Berlin, School of Business and Economics. His research focuses on the causes and consequences of economic inequality and social mobility. 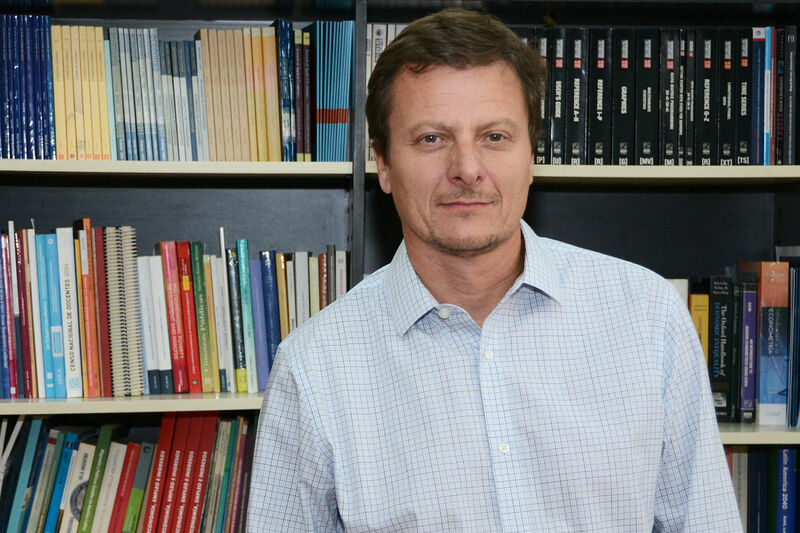 Leonardo Gasparini is founder and director of the Center for Distributive, Labor and Social Studies (CEDLAS) at Universidad Nacional de La Plata (UNLP) in Argentina, a research institution devoted to the study of development and social issues in Latin America. Gasparini has a Ph.D. in Economics from Princeton University. He is professor of Economics at the Universidad Nacional de La Plata and researcher at the National Scientific and Technical Research Council in Argentina (CONICET). 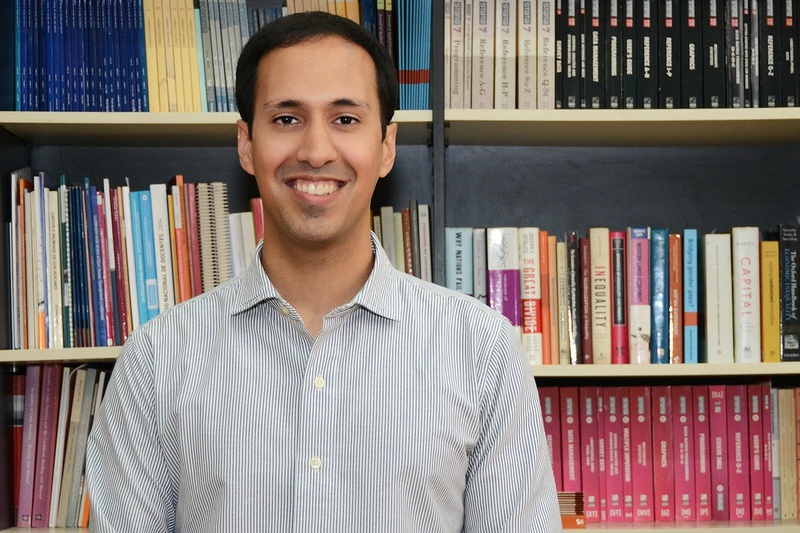 His main research interests comprise income distribution, poverty, social policy, informality and other labor issues. Joaquín Serrano is junior researcher at the Center for Distributive, Labor and Social Studies (CEDLAS) of the National University of La Plata (UNLP). He holds a Master Degree in Economics from UNLP. He is currently a PhD student at University of California – Los Angeles (UCLA). He participated in research projects related to the areas of applied econometrics, income distribution and labor economics.